1) Paint your nails except one and let them dry. Apply a layer of fast drying topcoat onto the glitter nail. 2) While the topcoat is still wet, sprinkle the crafts glitter all over it. 3) Dab your finger lightly onto a hard surface or use a small brush to get rid of the extra glitter. 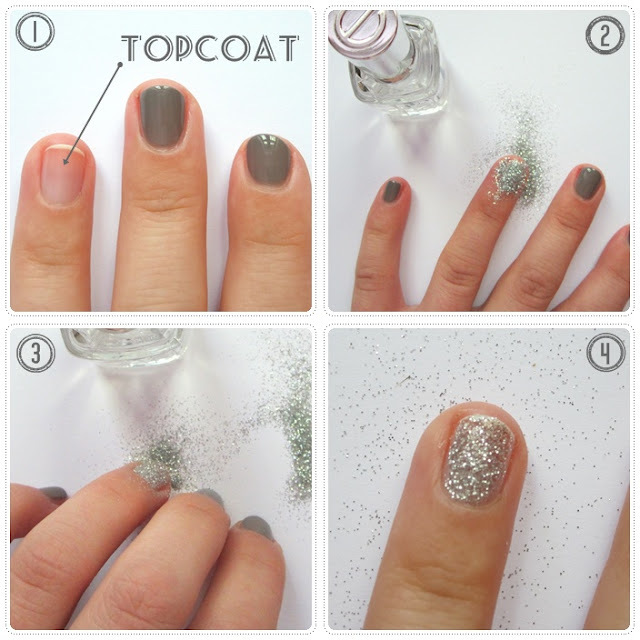 4) After a couple of minutes, apply another layer of topcoat to make your glitter nail long lasting. Love the neutral colour with the glitter. Where's the engagement ring? ;) Would fit perfecly with this as a highlighting eyecatcher.